Automatic Front And Back Labeling Machine Model NKSAL-120D Is Used To Apply Front And Back Labels On Flat/Oval/Square/Round Shape Containers With Output Upto 120 Labels Per Minute Depending On Products And Label Size. This Labeling Machine Also Referred As Double Side Sticker Labeling Machine As It Apply 2 Label Simultenasoly On The Bottle. Facility to incorporate the Batch coding printing like Inkjet printing or hot foil coding & contact coding. No Change Parts for Label size, Feed Worm and Pocket System required for change in product size. Single Pot On-line Speed Variation control. 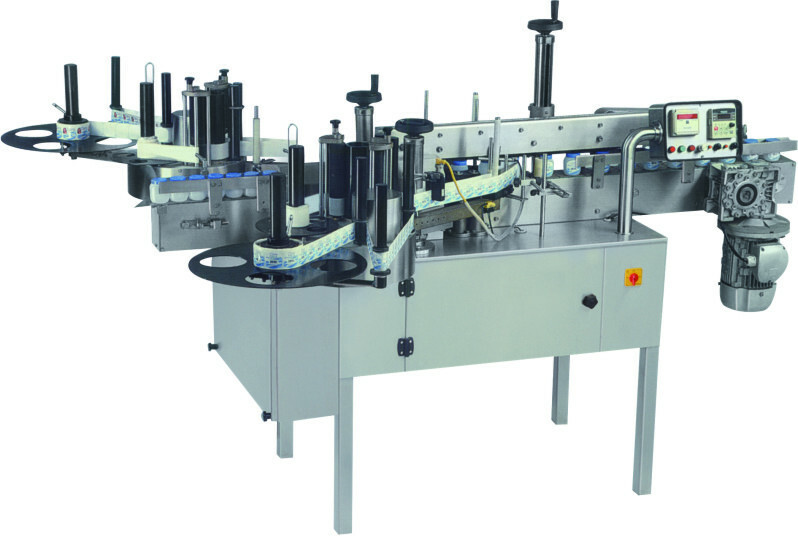 Synchronized speed of Label Dispensing, Conveyor and Top Hold Belt System. Easy to change label application heigt. User Friendly Label Placing Adjustment. Suitable for On-Line Inkjet and Contact Coding System. Fully Stainless Steel finish Machine. Up to 60-70 Labels per minute depending on Product and Label Size. The speed is also depending on stable movement of product on machine conveyor at higher speed.